i apologize in advance for what is about to be a personal post but i’ve got a forum and i’m using it. 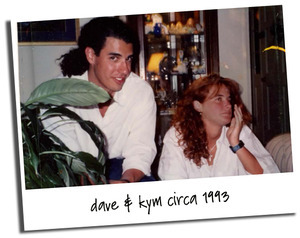 today is a big day in the history of my life – fifteen years ago dave & i entered into our life together. when i think back fifteen years and wonder if i could have imagined what our life together would become the answer is a resounding “no.” were i able to imagine this life i would have wanted to get right to it and that would have yielded a different result. together we’ve gone through many lean, hard years and we’ve gone through some dark, dark times, and we have not always been the nicest people to each other but i would not trade a minute that i’ve spent with this man nor what all that pain and darkness begat. our life is something my dreams are made of, actually there is no way i could have dreamed this life up…i’m just not that creative. for the most part dave & i spend our days no more than 20 feet away from each other and i still enjoy the greater part of every second with him (a few seconds could probably disappear and not be missed). somehow i lucked into this life with him and for that i am ever so grateful. this is the first photo ever taken of us and it has been in the same frame in essentially the same spot (albeit in different houses) for about 16 years. it doesn’t look like anything special but to me it is a photographic representation of my life changing.. happy 15th anniversary to us!